Download "Técnicas de Comunicação Audiovisual / Audiovisual Communication Techniques"
2 reality; its specificities ; basic notions of ethics as applied to the syllabus; the techniques of audiovisual communication through the joint use of sound, words, written text and image; technical codes and codes of mise-en-scène; audiovisual narrative; genres; different techniques to different media. 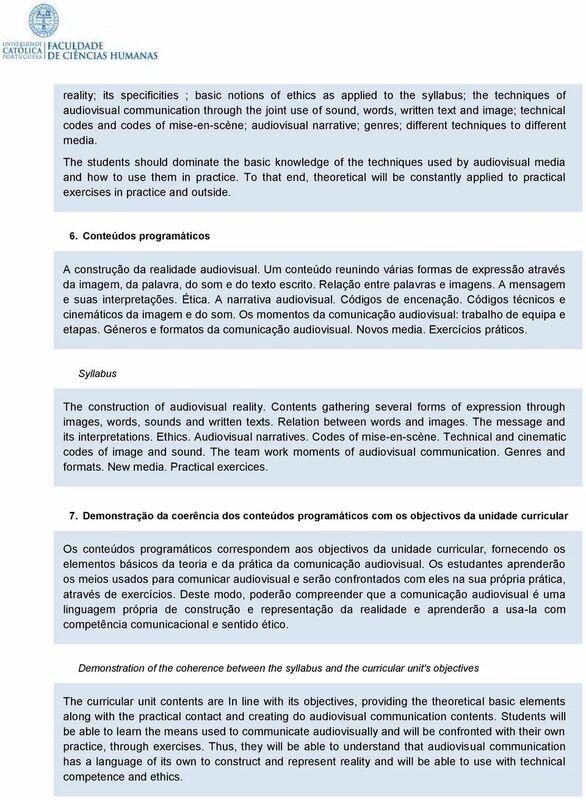 The students should dominate the basic knowledge of the techniques used by audiovisual media and how to use them in practice. To that end, theoretical will be constantly applied to practical exercises in practice and outside. 6. Conteúdos programáticos A construção da realidade audiovisual. Um conteúdo reunindo várias formas de expressão através da imagem, da palavra, do som e do texto escrito. Relação entre palavras e imagens. A mensagem e suas interpretações. Ética. A narrativa audiovisual. Códigos de encenação. Códigos técnicos e cinemáticos da imagem e do som. Os momentos da comunicação audiovisual: trabalho de equipa e etapas. Géneros e formatos da comunicação audiovisual. Novos media. Exercícios práticos. Syllabus The construction of audiovisual reality. Contents gathering several forms of expression through images, words, sounds and written texts. Relation between words and images. The message and its interpretations. Ethics. Audiovisual narratives. Codes of mise-en-scène. Technical and cinematic codes of image and sound. The team work moments of audiovisual communication. Genres and formats. New media. Practical exercices. 7. Demonstração da coerência dos conteúdos programáticos com os objectivos da unidade curricular Os conteúdos programáticos correspondem aos objectivos da unidade curricular, fornecendo os elementos básicos da teoria e da prática da comunicação audiovisual. 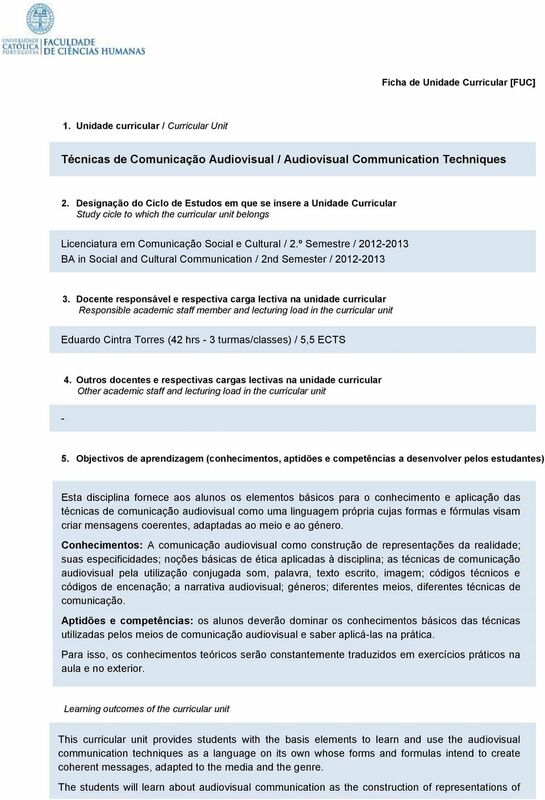 Os estudantes aprenderão os meios usados para comunicar audiovisual e serão confrontados com eles na sua própria prática, através de exercícios. Deste modo, poderão compreender que a comunicação audiovisual é uma linguagem própria de construção e representação da realidade e aprenderão a usa-la com competência comunicacional e sentido ético. Demonstration of the coherence between the syllabus and the curricular unit's objectives The curricular unit contents are In line with its objectives, providing the theoretical basic elements along with the practical contact and creating do audiovisual communication contents. Students will be able to learn the means used to communicate audiovisually and will be confronted with their own practice, through exercises. Thus, they will be able to understand that audiovisual communication has a language of its own to construct and represent reality and will be able to use with technical competence and ethics. 4 Escrita e leitura de textos para rádio. Escrita e leitura de textos para televisão. Realização de reportagens no exterior e sua análise em aula. Realização de entrevistas. Deste modo, conjugam-se os conhecimentos téoricos, a análise de conteúdos profissionais e a aprendizagem prática das técnicas de comunicação audiovisual pelos próprios alunos. 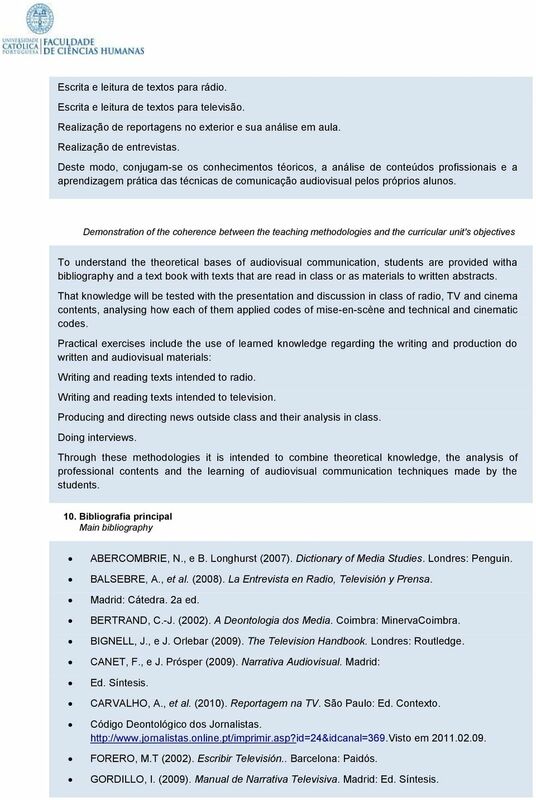 Demonstration of the coherence between the teaching methodologies and the curricular unit's objectives To understand the theoretical bases of audiovisual communication, students are provided witha bibliography and a text book with texts that are read in class or as materials to written abstracts. That knowledge will be tested with the presentation and discussion in class of radio, TV and cinema contents, analysing how each of them applied codes of mise-en-scène and technical and cinematic codes. Practical exercises include the use of learned knowledge regarding the writing and production do written and audiovisual materials: Writing and reading texts intended to radio. Writing and reading texts intended to television. Producing and directing news outside class and their analysis in class. Doing interviews. Through these methodologies it is intended to combine theoretical knowledge, the analysis of professional contents and the learning of audiovisual communication techniques made by the students. 10. Bibliografia principal Main bibliography ABERCOMBRIE, N., e B. Longhurst (2007). Dictionary of Media Studies. Londres: Penguin. BALSEBRE, A., et al. (2008). La Entrevista en Radio, Televisión y Prensa. Madrid: Cátedra. 2a ed. BERTRAND, C.-J. (2002). A Deontologia dos Media. Coimbra: MinervaCoimbra. BIGNELL, J., e J. Orlebar (2009). The Television Handbook. Londres: Routledge. CANET, F., e J. Prósper (2009). Narrativa Audiovisual. Madrid: Ed. Síntesis. CARVALHO, A., et al. (2010). Reportagem na TV. São Paulo: Ed. Contexto. Código Deontológico dos Jornalistas. em FORERO, M.T (2002). Escribir Televisión.. Barcelona: Paidós. GORDILLO, I. (2009). Manual de Narrativa Televisiva. Madrid: Ed. Síntesis. 5 JESPERS, J.-J. (1998). Jornalismo Televisivo. Coimbra. Minerva. PÉREZ, G. (2010). Informar en la E-Televisión. Barañáin: EUNSA. Yorke, I. (1998). Jornalismo diante das Câmeras. São Paulo: Summus Ed. 2a ed. Abordagem dos aspectos teóricos e práticos ligados às competências específicas do Psicólogo no desempenho da sua actividade avaliativa.